Over the past few weeks, I’ve had the pleasure to write here about two truly splendid minute repeaters, both property of a good friend: the Patek Philippe Reference 5074P and Reference 5078P. They both look great, but I’m guessing that if you’ve been following this series you’re most interested in how they sound. 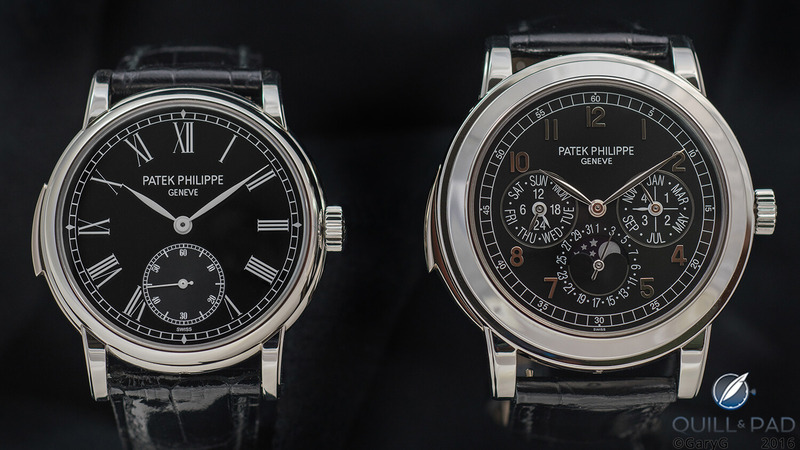 For me, a big part of the fascination of these two pieces is how Patek Philippe was able to execute two fundamentally different, yet coherent, design concepts within the constraint of a platinum-cased, black-dialed minute repeater. The 5074 is almost brutish with its muscular shoulders and blocky applied Arabic numerals, while the 5078 is a study in finesse. 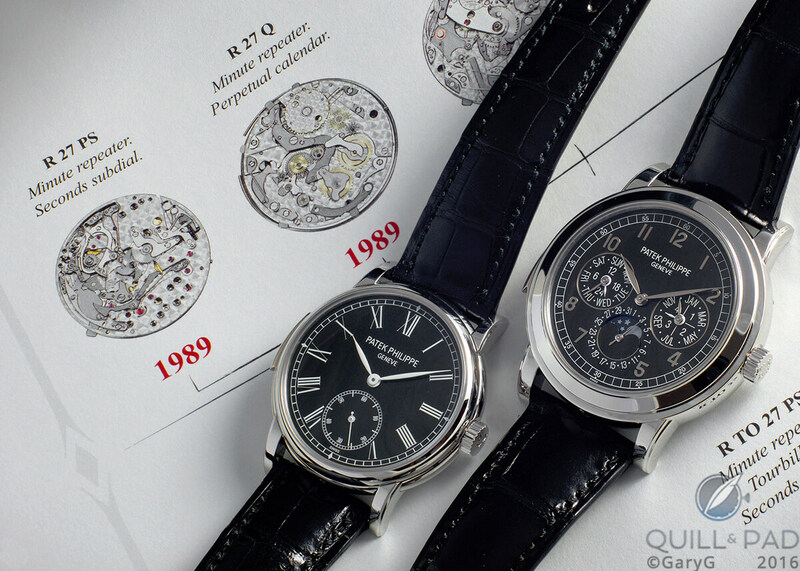 Both watches are powered by movements based on Patek Philippe’s R27 caliber, but with important differences: the 5074 boasts both a perpetual calendar and extra-long, highly resonant cathedral chimes, while the 5078 is a more straightforward repeater execution with a small seconds display. Given the opportunity to see the movement sides of these two awesome pieces side by side, I have to confess a preference for the packaging of the 5078P: the narrower bezel makes the movement appear more prominent, while the 5074’s movement seems to the eye to be recessed a bit within its enclosure. Flipping the watches back over to the dial side provides a wonderful view and also allows us to consider the small design choices that make these watches different, from the color of the hands to the use of applied gold numerals on the 5074 to the fonts and their respective sizes. And if you look carefully at the photo above, you will see that on the 5078 the second “E” in “GENEVE” is connected to the following “V,” while on the 5074 dial each letter stands alone. And now, on to the chime-off! As they step into the ring (pun intended), let’s take one more side-by-side look at the contenders. Let’s start by listening to my clear personal favorite. Well, at least it was until I listened to both watches side by side a number of times! The 5074 is one of two Patek Philippe watches (the other being the Sky Moon Tourbillon) to feature cathedral gongs, and the enduring, resonant sound they deliver is, for me, like nothing else. As much as I love the sound of the 5074, the 5078 – and especially this particular example – comes close. It’s part of the accepted wisdom about repeaters that different examples of the same watch can sound significantly different from each other given the complexities of creating each piece. I’ve heard a number of 5074s over the past few years, and I can’t remember another sounding quite this bell-like and sweet. And remember, both of these watches are cased in platinum, a metal that is reputed to be among the worst for transmitting the sound of repeater chimes! Either one of these watches could be the centerpiece of a splendid collection; my friend happily admits that he is extremely fortunate to own both and sees both of them staying in his watch box for the long run. But since part of collecting involves making tough choices, which would you select if you could only have one and why? I’d love to hear your views in the comments section below. The video above features both Reference 5078P and Reference 5074P playing one after the other for an easier comparison. Gary, both are stunning and the videos were amazing. Great sound capture. Just one thing to point out – you said no recent auction sales of the 5074P but that isn’t true – May 2016 in Geneva at Christies, one sold for $425,000 USD. Also, a sealed brand new 5074J sold for $370,000 recently as well, June 2016 at Sothebys. Thanks for the update — don’t know how I missed the Christie’s result as I routinely check there when compiling the Quick Facts, but more information = better! Well worth the wait. Although it’s hardly fair to judge them via my little speakers and the internet, I feel like the 5074 has the richer tone perhaps? Nevertheless, the 5078 is my hands-down favourite. Clean, elegant dial, thinner bezel, just the best, the best! Thanks, Ryan — it’s interesting to me that my informal poll of folks shows the 5078 ahead of the 5074 by a fairly large margin — there is of course a great deal to be said in its favor! Gary excellent article. Highly educational like your other articles. These two watches are spectacular. If I had to choose one, I would choose the 5078. Time only, 38mm, arabic numerals, but that slide on the left changes entire perception. Something stealth and sinister at the same time. I love time-only watches. Please continue writing articles such as this. I hope to learn much more from you and apply it in building my own collection. Thanks so much, Kunal — I have learned tremendously from fellow collectors over the past years, and am delighted to be able to share some of what I’ve learned with you and others here at Quill & Pad. Will look forward to seeing your future additions! Interesting comparison, and thanks so much for putting the great work into comparing these two pieces. For me, the 5078 is much, much better than the 5074. As a classically trained musician with extremely discerning ears, there is a night and day difference between the two. The higher pitched gong on the 5074 is OK – a pure sound and good resonance, if slightly nasal in tonality – but the lower pitched gong is very clipped. It hardly resonates at all, and again has a rough nasal tonality to it. Finally, the pitch difference between the two is very grating – it’s sounds like a quarter tone below a minor third. With the 5078, both gongs have a very clear tone – no nasal quality here – and good resonance. Pitch wise, the difference is extremely close to a minor third, and much more pleasing to my ears. Having said that, both pale into comparison with the Credor Sonnerie, which has the best sound of any chiming watch I have ever heard, and by a considerable margin. As always, deeply thoughtful remarks, Gerald! Thanks very much for taking the time to read, listen, and comment. I have to confess that I’ve now given up on expecting repeaters to exhibit my preferred interval between pitches (as you know from prior discussions, a major third) and neither of these pieces hits the mark there in any case so I omitted that consideration from my comparison. I’m an instrumentalist of sorts, not a musician (as you know, there’s a big difference between the two!) so I will trust your assessment on the tone of the 5074; that said, it’s still very much to my personal taste. Oh my, the 5078P by far. Such a musical, full tone. The 5074P, while certainly beautiful, sounds a little tinny and flat by comparison. Thanks very much for weighing in, Michael! The 5078 does have a beautiful round tone, to be sure — looks as if you and others prefer it! While I can appreciate all that the 5074 offers in both technical prowess and ‘complete package’ idea.. I like my perpetual calendars and repeaters separate. The 5078 represents to me the epitome of what a MR stands for.. stealthy elegance for the wearer. Tonally as well, I find my preference to be with the 5078, however that could be affected by preference for the reference. Hope to see one in person someday; however your breakdown of the two has been a pleasure to take in. Thank you Gary, and happy holidays.